U.S. Ambassador to Georgia Richard Norland said that the United States and many other countries are facing the threat from the radical Islamist group known as the Islamic State (IS), and the flow of young men to IS remains a serious problem for many developed countries – not only for Georgia. The statement came after news that two more Georgian men from Pankisi joined the barbaric group in Syria recently. “Georgia’s situation is not unique. 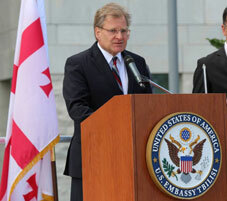 We greatly appreciate our cooperation with the Georgian government in dealing with this common problem,” stated Norland. Minister of Education and Science of Georgia Tamar Sanikidze also responded to the fact. She stressed that teachers mentioned nothing suspicious in the actions of the two teenagers. “The ministry is actively collaborating with necessary institutions to minimize the risk of leaving the country,” she said. Locals have already appealed to the government to pay close attention to the dangerous tendency, as up to 100 young men have left for Syria, while 11 of them have been killed fighting for IS. The locals stress that there are some groups in the gorge recruiting the youth for IS. Visa-free travel with Turkey and three prominent leaders of IS from Pankisi gorge also encourage the flow, analysts say. They stress that young men look at Syria as a place of self-realization, while the current socioeconomic situation of the gorge is poor. Locals have also requested that the government introduce tough checks at the Georgia-Turkey border, as one of the individuals crossed the border due to a processing mistake. The indifference of border guards also contribute to this problem. The opposition accuses the government of ignorance with regard to the difficulties Pankisi residents face.